".a couple of hours later, during the descent, I purposely made a detour so as to pass the place where the 'man' or 'beast' had been seen. I examined the footprints, which were clearly visible on the surface of the snow. They were similar in shape to those of a man, but only six to seven inches long by four inches wide at the broadest part of the foot. 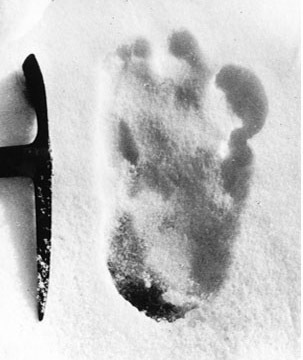 The marks of five distinct toes and the instep were perfectly clear... the prints were undoubtedly those of a biped.." - N. A. Tombazi, Zemu Glacier, Himalayas 1925.